In this section we will put pictues of buildings and sections of the downtown area, i.e. some 3rd, mostly 4th, 5th, 6th Streets that existed in the second half of the 1800s. 1880. Sixth St. Planing Mill. Frame Bldg. future site of American Theater. Brick Bldg. future Isaly's (Bricker's) site. Mill operated by W.L. Smith. Above: Westside of Market at Fourth St. looking north. Bldg at left is on 4th and Market. 1875. 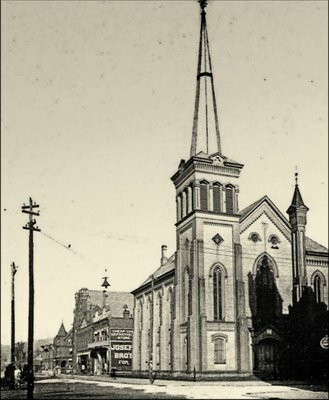 The church you can see on the far right is the United Presbyterian Church which sat on the Northwest corner of Market at Fifth St. Dr. Birkett's "Magic Lantern Slides". United Presbyterian Church. See "Downtown of 1900s" for more information on this building. 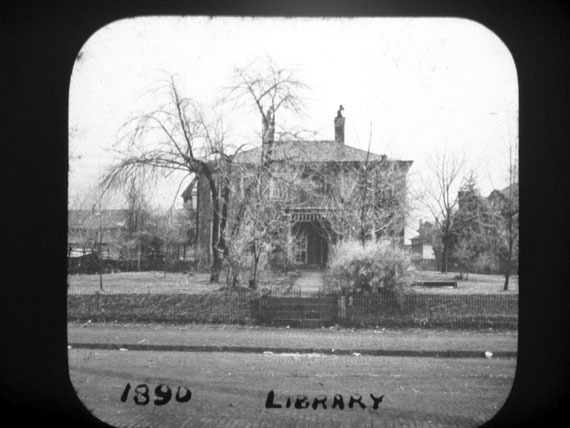 Corner of 4th Street and Broadway before the Carnegie Library was built.